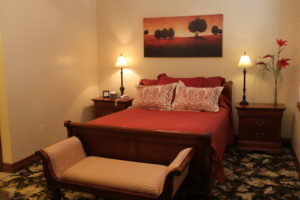 Homey boutique hotel with rooms that are spacious and comfortable. 2 rooms above the old Caldwell Messenger. Old printing press downstairs in coffee meeting room area. 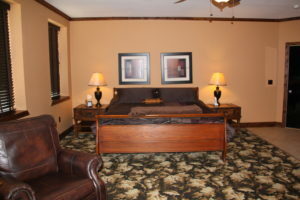 2 rooms with a view of the railroad tracks and Main Street. Microwave and coffee maker downstairs. In order to reserve a room, just call Kathy Risley at (620) 845-4195. Room prices are shown next to the rooms on the right. This room provides a lot of space to spread out. Nice overstuffed leather chairs to watch TV and a table for working or eating. Includes a mini-refrigerator, coffee maker and satellite TV. Free WiFi. The smaller suite also has a mini-refrigerator, coffee maker, satellite TV and free WiFi. A small work table and chair is available for those that need a work space. Step back in time in historic downtown Caldwell, Kansas. Several restaurants, bars, churches, school and shopping within 5 blocks of the hotel. One of our favorites is the Last Chance Bar & Grill at 30 S. Main. which has excellent food and a great selection of low priced liquor, wine and beer. Other great places include The Red Barn – 624 S. Main and The Shack at 23 E. Central across the street from the hotel. 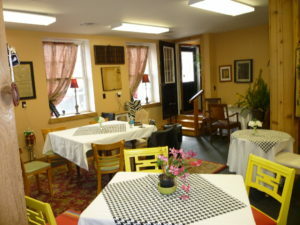 We host many wedding parties and reunions in the downstairs coffee and meeting room area. Make sure you call in advance to ensure you reserve the rooms and event area. This printing press located downstairs is over 130 years old and was operational until the 1960’s. There are several old framed newspapers that bring back Caldwell’s history. Modern luxury with old town charm. Within walking distance of restaurants, bars, churches, post office, grocery store, shopping, florist, salon and school. Walk through historic downtown and immerse yourself in history. Start by going downstairs with all the precious names of all newspapers that were printed prior to what is now the Caldwell Messenger. 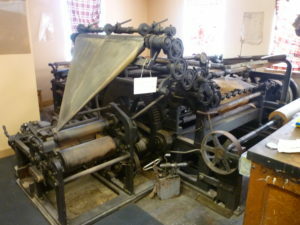 On the first floor is an original antique printing press! Walk downtown and explore businesses, historical markers, historical buildings and great folks. On old Chisholm now highway 81. 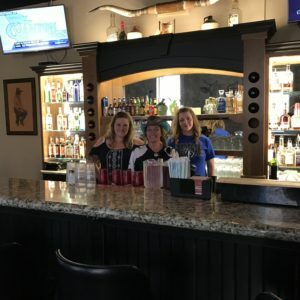 Caldwell Messengers Suites is located in downtown Caldwell, Kansas approximately 50 miles south of Wichita, KS and 15 miles West of Interstate 35 on Highway 81.